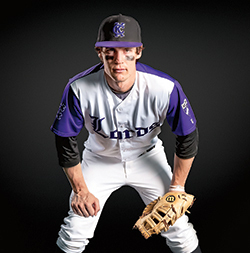 Nate Lotze, a senior on the Lords baseball team, subscribes to the long-standing belief that "if you look good, you play good." Yes, it should be "play well," but Lotze likes a creative touch. "I just love baseball, and for me it's a form of creative expression," he explained. "People don't normally look at sports that way, but for me it covers everything from the way you dress, to the player you make yourself, to the work you put in, to the way you are viewed by teammates and opponents, to the successes you have on the field. Those are all definitely ways of expressing yourself." Take the look he's adopted. Lotze sports eye black, stirrup socks, and pants pulled up near the knees. White cleats and an undershirt with three-quarter-length sleeves complete the ensemble. "It's a gritty, hard-nosed look and that's the way I like to play," he said. Appearances may not be everything, but you can't argue with success. Lotze has had a lock on the Lords' starting first base position, as well as significant roles as team captain and cleanup hitter. He's already set the Kenyon record for career put-outs, while his career batting average and on-base percentage currently rank top-five in program history. the KAC [Kenyon Athletic Center] probably don't know that I like writing and playing guitar." Here's a quick run around the bases with Lotze.